I was recently asked to provide some background knowledge for a Japanese film production company that was intending to feature Dunedin’s railway station in a television series called Giants of Beauty (title loosely translated by the director). Curiosity piqued, I went to locate what I already knew had been written about the station and its architect George Alexander Troup and found surprisingly little that is new. Despite the fact that Troup’s crowning achievement is one of the nation’s most admired buildings, information about it was often repeated from a limited number of sources including a biography written by son Gordon in the 1960s. From this we know that Troup’s ‘nickname’ was Gingerbread George and that he was knighted after a lifetime of dedicated public service. Troup the man remains somewhat shrouded. The other question is why is the Railway Station described as a Flemish Renaissance building? Some insights into what drove Troup can be found in his early years in Scotland. Gordon Troup recounts that George Troup senior was drowned in the Union Canal in Glasgow in 1874 when his son was aged 11. His death certificate reports that he was found dead in the Forth and Clyde Canal near the South Speirs Wharf, a short walk from where the Troups were living in Port Street. There is no evidence that Troup took his own life but newspapers of the day often carried reports of ‘well dressed men’ found dead in the city’s waterways. However it occurred, the sudden death of George Troup caused the family great distress. It is sad to note that his body was identified by Jane Troup, the eldest daughter. This background of reversal of fortunes is not uncommon in nineteenth century architecture and may have helped shape Troup’s keen sense of social justice and life long bonds to the Presbyterian church. It may also help explain his dedication to the welfare of disadvantaged boys as the Troup family’s relatively comfortable existence was ended abruptly at this point. All that lay ahead was struggle. George needed an occupation and fortunately Troup’s father had been granted the status of burgess (a freeman of the city) in Aberdeen, allowing his son to study at high school. George boarded at Robert Gordon’s College, founded in 1750 and located in a fine Robert Adam-designed building in the centre of the city. Gordon (1688–1731), a successful merchant, set up the school in his will with his aim being to ‘found a Hospital for the Maintenance, Aliment, Entertainment and Education of young boys from the city whose parents were poor and destitute and not able to keep them in schools, and put them to trades and employment’. Robert Gordon’s College was something of a double-edged sword, offering a way ahead but also a reminder of the circumstances that brought Troup there. Architecture was often seen as a pathway for self-improvement, not as tied to class and privilege as other professions such as law and medicine. On leaving the college, Troup joined the Edinburgh engineer C.E. Calvert as an articled pupil in 1879 at the age of 16. This was an apprenticeship in the tradition of articled pupilage and the trainee was not expected to earn a wage while learning the routines of the profession. In most situations, parents paid to place their sons with an architect. Calvert is noted as being particularly busy in the late 1870s despite the failure of the City of Glasgow Bank and the general downturn of building in Scotland afterwards. Troup left Calvert and joined another Edinburgh architect, John Chesser, as an architectural apprentice. In 1881, Jane and five of her children were living in Edinburgh while George continued his articles. The office was not particularly busy over the two years that Troup spent there and the arrangement ceased following the death of his mother in 1883 from heart disease. George then followed three of his older sisters to New Zealand, working his passage on the freighter S.S. Fenstanton, soon to be wrecked in the Torres Straits. Fortunately, Troup had left the ship in Port Chalmers although the entire crew survived the sinking. Troup was twenty when he arrived in Dunedin. It is not hard to imagine that the younger members of the Troup family wished to place some distance between themselves and the troubles they had faced in Scotland. George Troup in 1927. S.P. Andrew photographer. Reference: Alexander Turnbull Library 1/1-018930-F.
With four years training in architects’ offices, Troup was already considered qualified but opportunities in Otago were limited by the start of the long depression of the 1880s. Troup gained employment as a surveyor with the Survey Department, working initially with a gang at Ngapara and later in the Central Otago ranges. Using the connections made by his brother-in-law, George Burnett, Troup met with James Burnett, an engineer with the New Zealand Railways Department. Troup entered the Dunedin office in 1886 after studying at the Dunedin School of Mines to improve his engineering skills. He set up house in a modest cottage at 21 Leith Street, Dunedin, with his unmarried sister Christina. While living there Troup would have passed the future site of the Dunedin Railway Station while on his way to the Dunedin office, at that time located in the old Dunedin Athenaeum and Mechanics’ Institute building in Manse Street. Troup was transferred to the Wellington office in 1888, where at 25 he became Chief Draughtsman. He was later appointed to the role of Office and Designing Engineer, only becoming Officer-in-Charge of the Architectural Branch in 1919. His early work was clearly influenced by William Butterfield, as shown in a private commission for the Wellington Boys’ Institute in conjunction with William Crichton. Troup was allowed considerable authority in Wellington and his first major building after carrying out timber stations at Oamaru and Whanganui was the new head office for the Railways Department, described as being Jacobean in style. Topped with exuberant Flemish gables and lanterns on the roofline, the building stood out from its more reserved neighbours and asserted the profile of the Railways Department amongst the other government offices housed in the capital. Gordon Troup wrote that the ‘Gingerbread George’ epithet arose at this time (1901-1903) and was associated with the rich design of the Wellington building, not specifically the Dunedin station. ‘Gingerbread architecture’ had quite a specific meaning. It was a way of referring to the North American taste for ornate sawn timber decoration of German and Swiss origin that had reached something of a peak during the fashion for Charles Eastlake’s houses. In America these filled the same niche as the Queen Anne style elsewhere. Eastlake himself decried the use of such decoration as a ‘bizarre burlesque’ so it was hardly meant in a complimentary way. I somehow doubt that anyone ever used this ‘nickname’ to Troup’s face. 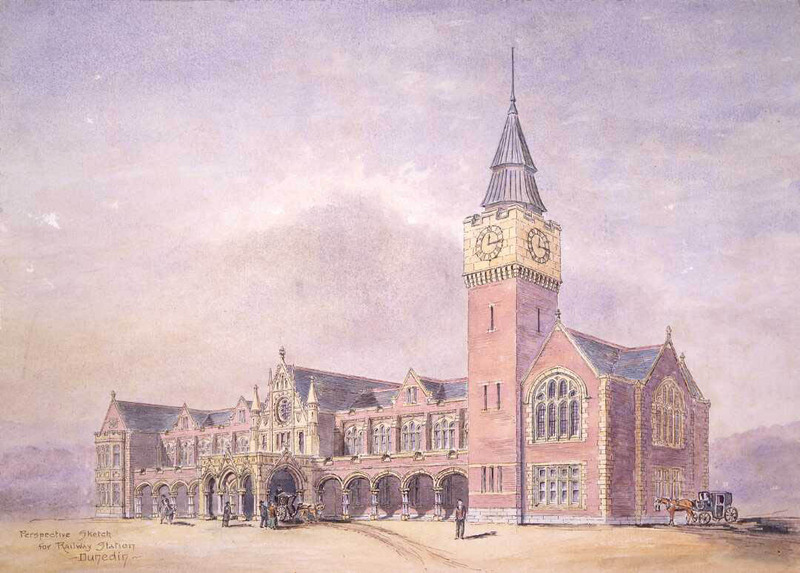 Troup is supposed to have entered two sets of drawings in what was described as a competition for the Dunedin Railway Station in 1903, one in Scots Baronial and the other in Baroque style. No evidence exists that any other architects competed for this prestigious work so we do not know what the other proposals were like. The competition may be seen as an effort to avoid accusations of favouritism by the Railways Department, its ministry headed at the time by Joseph Ward (1856-1930), a noted supporter of South Island interests. Ward followed Richard Seddon as Prime Minister in 1906 and was able to open the station in his new role when it was completed. Is this the version of the station that Troup preferred? The Gothic details now seem unconvincing compared to the Flemish Renaissance scheme that was finally built. Reference: Alexander Turnbull Library B-064-007. 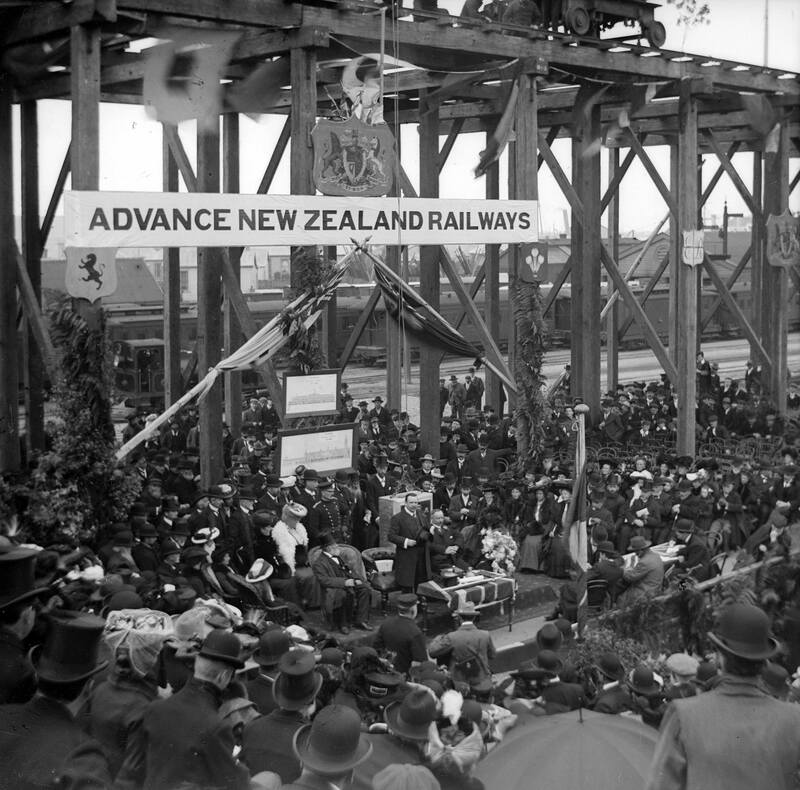 Sir Joseph Ward laying the foundation stone of the station on 3 June 1904. Photograph by William Williams. Ref: Alexander Turnbull Library 1/2-140194-G. The Baroque variant, initially proposed in red brick, was selected and featured an asymmetrical composition with unequal height towers at both ends of long bays. A porte-cochere occupied the central section under a tall triangular pediment. Troup’s son Gordon in his biography suggests that the Scots Baronial or ‘Francois I’ style alternative was favoured by Troup himself. The reference to King Francis of France I refers to the Château de Chambord and the hunting lodges of the French Renaissance and implies a French Renaissance chateau style design. This description may involve a misattribution as the only two drawings known to exist show stations of similar proportions and layout. One was in a Tuscan Gothic style and not at all like a Scots Baronial or French Renaissance design. The awkward peaked roof that replaced the expected campanile above the square clock tower showed Troup’s hesitancy about going the whole way towards Italian Gothic Revival. The final result suggests he was on safer ground with his alternative Flemish scheme. So what was Troup intending by using such an exotic manner on what was to be the Government’s flagship building in Dunedin? Like many of his generation, Troup’s architectural taste was influenced by English seventeenth-century Baroque architecture, at that time being reevaluated positively by critics. Being an admirer of John Vanbrugh (1664–1726) stood both for loyalty to the British Empire and a more adventurous spirit that ranged further abroad for influence. Vanbrugh was of Flemish descent and part of an Anglo-Dutch network of Protestant reformists. He introduced the Baroque manner to England with Blenheim Palace (1705–1722) and Castle Howard (1699-1709). Troup also used ideas from Scottish architect James Gibbs (1682–1754) whose distinctive rusticated openings, known as the ‘Gibbs surround’, appear throughout the Dunedin station composition. As with Gibb (who was quietly Catholic), Troup was not strongly Anglophile and remained attached to the eclectic design principles that he applied with great character to his major buildings in Wellington and Dunedin. These models suggest that Troup was not completely convinced by the alternative ‘Wren-aissance’ direction that took a more academic approach to Neo-Renaissance architecture in the late nineteenth century. This involved close attention to the buildings of Christopher Wren (1632–1723), leading architecture towards a simplified and rational classicism. The design of the Wellington office was broadly symmetrical in its massing, a treatment that suited its urban setting on Featherston Street. The irregular siting of the Dunedin station aligned to the railway line rather than the street grid itself suggests an opportunity for a building to be seen in the round and that allowed for more formal experimentation. The definition of the Dunedin station design as Flemish Renaissance comes from Troup himself. Architects assisted journalists with these precise terms that went beyond the knowledge of an observer to deliver with any authority. Was Troup familiar with the Flanders area and its building styles? His other passion for breeding Friesian cattle suggests a connection, as does his support for the Dutch/New Zealand painter Petrus Van der Velden (1837–1913). Troup funded the purchase of nineteen of the Netherlander’s paintings for The New Zealand Academy of Fine Arts in 1922. Anglo-Dutch style was popular in late nineteenth-century Britain, particularly in the London suburb of Kensington. Architects such as Richard Norman Shaw and Ernest George popularised tall red brick houses with elaborately shaped gables at the roofline and the style became known as Pont Street Dutch. Something similar was used at Olveston by Sir Ernest George who had introduced the style in London twenty years earlier. Troup’s reasons for using this particular architectural expression remain obscure but seem to be determined by personal choice rather than some random throwing together of architectural elements. Troup was striving after a distinctive local language for railways buildings in order to set them apart in the rapidly maturing streetscape. Petrus van der Velden. Burial in the Winter on the Island of Marken (The Dutch Funeral) 1875. Reference: Wikimedia Commons. Revivals of past styles always involve a complex relationship with history. Flemish Renaissance Revival architecture itself began in Belgium during the later part of the nineteenth century. Belgium as a nation had only existed since the 1830s, absorbing part of Flanders and French speaking Wallonia. The search for a national style of architecture to express the rich cultural history of the region focussed on the successful trading cities of the Lowlands. Brussels as its major city was essentially rebuilt along French lines in the mid nineteenth century as the new commercial and political hub of the Belgian nation. In order that it did not appear as a clone of Baron Haussmann’s Paris, a form of local revivalism was used in preference to French Renaissance. Flemish Revival architecture was shown off to the world at the Paris World Exhibition (1878) where the Belgian Pavilion designed by Emile Janlet gained favourable attention. Details of its facade relate closely to George Troup’s station and it is likely that Janlet’s pavilion was published in sources that Troup would have had access to. Albums of photographs of the pavilions were in circulation in New Zealand and have been reproduced in the excellent blog Early New Zealand Photographers and their Successors. The main characteristic of Flemish Renaissance Revival architecture is the gable which took on a distinctive profile formed with curves and straight line sections. Tall square and octagonal towers offset from the centre of the compositions are also notable. Use was made of polychromatic contrasts of red brick and pale stone. Although a busy composition, Troup’s design pared Janlet’s decoration back to a smaller number of repeated elements able to be assembled from a regular set of parts for economy. Troup, for instance, used standard double hung sashes instead of the transomed multi-section windows used in the Belgian pavilion and elsewhere. There was also the example of the new city stations being built in Amsterdam and Amstel, carried out in a simplified red brick style that blended Gothic and northern Renaissance styles. The visual height of these buildings was offset by strong horizontal banding. When red brick was combined with pale stone or plaster facings the effect was cheekily called ‘streaky bacon’ and can be seen in John Campbell’s police station and prison (1898) that faces the station across Anzac Square. This visual contrast of materials was accentuated in the railway station by the use of dark basalt stone and Oamaru limestone. Troup’s original brick proposal was closer to its Belgian and Dutch prototypes than the version that was finally built. Stone, particularly when extracted from the railways owned quarry at Kokonga, proved to be a cheaper building material than brick and gave an even more substantial appearance. Troup’s clever economies included using day labour to cut and finish the stone on site. This was then lifted into place by a mobile crane, enabling the building to rise very quickly. Rather than being anachronistic, Flemish Renaissance Revival architecture represented the freedom to experiment with a variety of materials and architectural types as well as signifying a progressive and technological approach. Troup wanted to place his stamp in Dunedin with its most significant public building of the new century. While it was complementary to Campbell’s Norman Shaw-influenced prison and Gothic Revival law courts just across the road, it was also distinctively different to both, adding a liveliness to the new Government quarter of the city. Dunedin was particularly fortunate to benefit from the creative competition between Troup and Campbell and the interplay between the individual buildings in this key precinct should be the topic for another blog entry. This aspect of generosity and pleasure, if not frivolity, seems a better fit for Troup’s character than the overused sobriquet of ‘Gingerbread George’. We should really stop calling him that. ‘1874 Troup, George’. Statutory registers Deaths 644/7 64. Berry, Mary Helen. 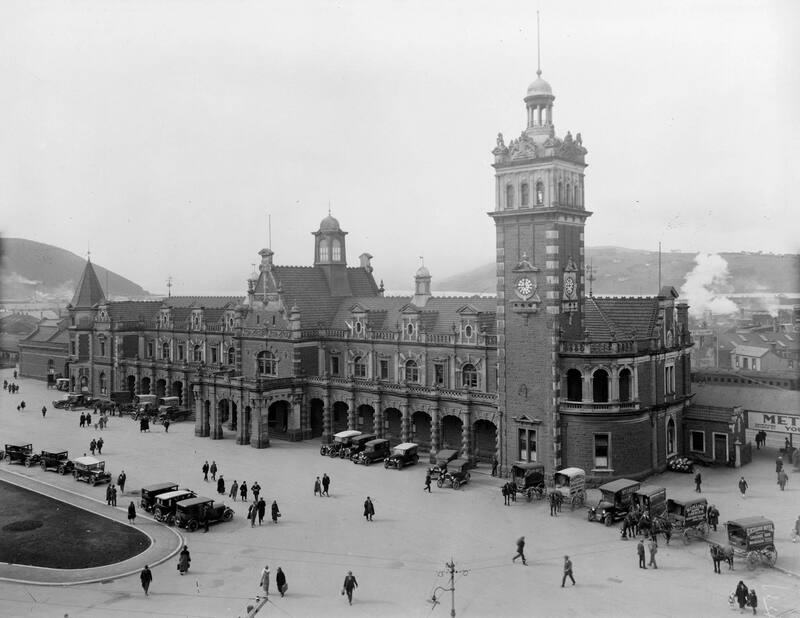 ‘Sir George Troup and the Dunedin Railway Station, 1903-1907: Edwardian Elegance or a Dilemma of Style’. BA (Hons) thesis, Department of History and Art History, University of Otago, 2005. Irvine, Susan.’ Dunedin Prison (Former)’. Heritage New Zealand. Retrieved 6 January 2018 from http://www.heritage.org.nz/the-list/details/4035. Troup, Gordon. George Troup: Architect and Engineer (Palmerston North: Dunmore Press, 1982). Whiffen, Marcus. American Architecture since 1780: A Guide to the Styles (Cambridge, Massachusetts: MIT Press: 1992). This entry was posted in Buildings and tagged 1900s, Anzac Avenue, Flemish, George Troup, Michael Findlay, Railway Station on 8 January 2018 by David Murray. What a great piece of research! And since Troup designed so many of NZ’s railway stations, relevant on a national scale. Thanks. I enjoyed writing it and reacquainting myself with the Station. It is great to see hundreds of tourists photographing it during the cruise ship season so its fame is international as well. It is interesting to read that this article has come about following interest from a Japanese company – I wondered if they are aware that in the mid 60s the original floor tiles in the main entrance were replaced by replica tiles manufactured in Japan? I was working as a draughtsman in Dunedin at the time – one of my employers, architect Ian McAllum, rescued several of the original train tiles (they were destined for the tip) and cast them into the concrete patio in his new house, which was being built at the time. The original floor in the station had subsided significantly (especially in the centre) causing the tile panels to crack. The decision was then made to replace the entire floor, the replacements – made in Japan….. Thanks for your comment Gary. The Japanese film makers were indeed very interested in this angle. The late Jim Dangerfield did a lot of work to record the 1960s restoration of the floor and his files at the Hocken were very informative. In 1962 there was a suggestion made by the local branch of the NZIA that a Japanese manufacturer could be found for the replacement mosaic floor. No positive replies were received with makers too busy supplying the US market and needing to change their process to produce a matt surface tile. A ‘British firm’ – most likely Royal Doulton – provided the floor in end but only after locating some of the tiles in Germany … and Japan. So yes, there are Japanese tiles in the floor but we do not know which ones. Is the source of the original tiles known? Were they locally produced or imported? David and I met with Dunedin stonemason Marcus Wainwright a couple of weeks ago and talked about this. Marcus has been looking for details of the contract for the relaid floor but the precise source of the tiles remains obscure. They were imported although local manufacture was also investigated by the NZIA when they were looking for a supplier in the early 1960s. We hope that continued digging in the archival sources will give us an answer. I will see how far Marcus has got and amend the article when we know more. Posts on this site, unless otherwise stated, written by David Murray © 2012-2019. All rights reserved. Historic images are reproduced by permission of various rights holders. Copyright should be checked before reuse on web or social media.